He’s having an unprecedented individual season, posting numbers and dominating like no player before him in a 15th NBA season. We’ve never seen anything like the 6-foot-8, 250-pound LeBron James — not as big, strong, agile and versatile on the court, and consistently brave enough to be vocal on social issues without fear of backlash. Sunday’s game against the Washington Wizards ended as another W for the streaking Cleveland Cavaliers, their 18th victory in 19 games, but it was James’ new kicks that stole the show and made the message about more than basketball. 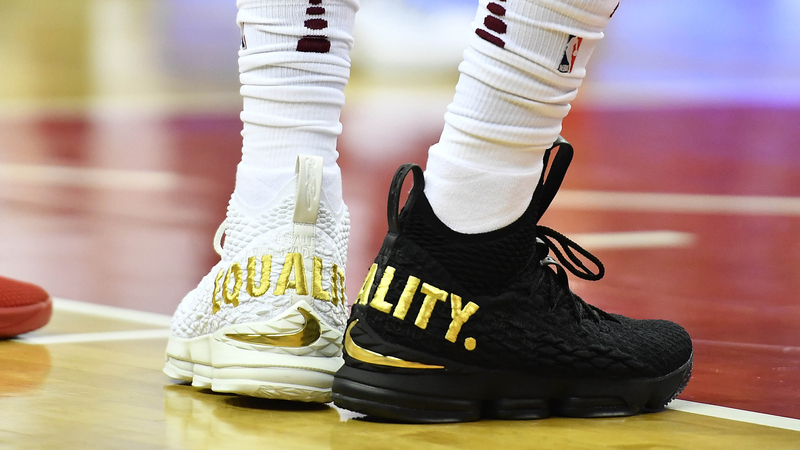 He wore a special pair of LeBron 15s: A white sneaker on his left foot and a black sneaker on his right foot, with “EQUALITY” inscribed on the back in gold stitching. For that, James is our Undefeated Athlete of the Week. We’d be disingenuous if we didn’t acknowledge that James was throwing shade at President Donald Trump. But his choice of footwear, and its message, has less to do with “45” and more to do with his track record of speaking out on social issues affecting African-Americans and other people of color. Our sentiments verbatim at The Undefeated. If you know an athlete — male or female, middle schooler, high schooler, college or professional, black or white — who is affecting his or her world for the better, we want to know who that person is. We want to hear their stories as we begin our Undefeated Athlete of the Week series. Email us at contact@undefeated.com.